Day 1  Flight to Reykjavík. Day 2  Arrival Reykjavík at Keflavik International Airport. Reception and private transfer from airport to our hotel, located in the city center. Reykjavik is a fascinating and enjoyable city; the day will be for resting and exploring. At 6:00 PM, we will meet in the lobby and walk together to a local restaurant. Here we will share a welcome dinner and our guides will go over the itinerary. Day 3  Morning departure to Fjallabak Nature Reserve. We will drive through the beautiful southern farmlands to reach the foot of the volcano Hekla, one of Iceland’s most active volcanoes. Here is where the climbing begins! We begin our climbing in Iceland with a nice hike up the mountain where there will be excellent views of the next day’s hiking from the summit ridge. We will descend by the same route and be met at the bottom with a short drive to the huts in Afangagil. Day 4  We set out for today’s hike east towards the stunning highland region of Landamannahellir. The trail leads through the tephra-covered hills of Valahnúkar and the moss-covered lava of Lambafitjahraun to reach the foot of the peak Mount Löðmundur. Here we will spend the night in a comfortable hut. Day 5  Today we depart the Landmannahellir huts for the Hrafntinnusker Plateau. We will hike across the grassy Kringla Plain, climbing up along the unique Klukkugil canyon heading towards the plateau of Hrafntinnusker. Before arriving at the plateau we will visit the captivating Reykjadalir Valleys where steam rises from different hot springs in the area. Day 6  Follow the path less travelled as we leave the trail behind and make our way across the rhyolite coloured hills of Hattur and Vesture Barmur to the highland oasis of Landmannalaugar. Here we will relax and ease our muscles in the natural pool located close to our comfortable huts. What would a trip to Iceland be without some ice and snow? 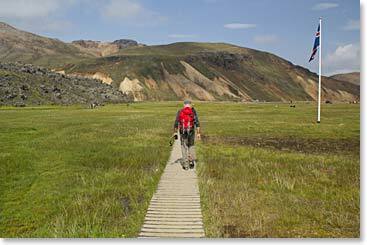 Day 7  Today we will take the opportunity to explore this beautiful area and climb to the volcanic peak of Bláhnúkur. The views from the peak are incredible and on the descent you traverse the rugged Laugahraun to the nearby Brennistainsalda peak for even more stunning vistas surrounding. Afternoon departure to Reykjavík. Upon arrival in Reykjavík, we will be transferred to our hotel. Evening farewell dinner at a local restaurant. Day 8 A private transfer to Keflavík airport for departure. We will visit and swim at the famous hot springs Blue Lagoon en route to the airport. Blue Lagoon is a unique source of geothermal seawater.